Eli Mikal Khan, six years old from Quetta has become an internet sensation because of his God gifted bowling skills. Eli successfully caught the attention of cricket legends through social media. This young talented Pakistani is from Chiltan Town Quetta. His bowling skills have been polished by continuous practice with his father Abdullah Khan at Millennium Cricket Club Quetta. Eli Mikal Khan is considered as Pakistan’s future Shane Warne. He can bowl flipper, slider, googly and leg spin. Abdullah Khan talked about his son’s passion. He told that Eli has been very passionate about cricket and has started practicing from six months. Abdullah himself is a very impressive father and a coach as he trains his son Eli and other aspiring cricketers at his academy in Quetta. Abdullah is a computer engineer and owns a business. He sensed the bowling talent in his son, and started training him. Eli Mikal caught the attention of cricket legends like Virat Kohli, Shane Warne and Wasim Akram after his bowling video went viral on social media. 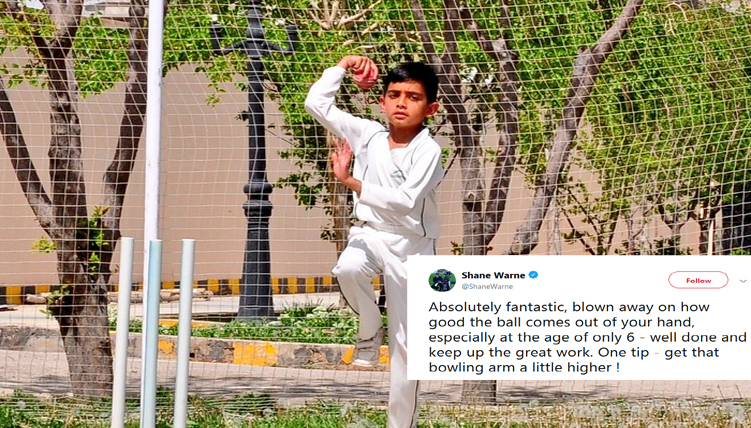 Shane Warne praised the young kid in these beautiful words. Thanks to all my supporters, keep supporting me.